Tracey is 49 years old and has lived in a Foundation Housing unit for the last four years. Although she has worked in the past, she’s been without any work at all for a number of years despite trying incredibly hard to find a job. In the meantime she gets by on a meager Newstart Allowance . Around 34% of Foundation Housing Tenants receive Newstart, the payment for ‘unemployed’ people. Tracey receives $560 each fortnight from Newstart. We charge her the lowest rent we can, but what’s left from her payment doesn’t go far. “Once my rent and electricity, and gas and water and all that is taken out I’m left with $250 a fortnight. … I’ve got to buy food to last me two weeks as well. “(Not working) It kind of makes you depressed really, because you’re stuck at home constantly because you don’t have any money to do anything. “Going to catch a movie or just doing something like going for a drive and a picnic,…… you can’t, you absolutely can’t do anything. Foundation Housing is calling on the Federal Government to #RaisetheRate by $75 a week so people like Tracey can do more than just survive. They need a fair payment that meets their basic needs while they continue to look for work. “(Raising the rate) would make a huge difference… a huge difference. I’d be maybe able to put a full tank of fuel in my car, which would be the first time ever. I’d be able to live a bit better with food. I’d be able to eat a bit healthier, with fresh fruit and veggies and things like that. I can go and get fresh fruit and veggies when I get paid, but by Tuesday maybe Wednesday, I won’t have any money to buy any for the next week and a half. So basically you live on two-minute noodles, just really cheap stuff. 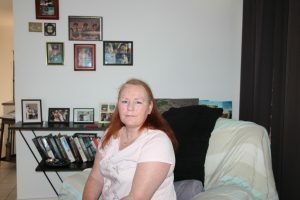 Foundation Housing is deeply concerned that people like Tracy are living in great hardship on as little as $11 a day. It is nearly impossible to look for paid work if you are homeless and hungry. Newstart has not increased in real terms in 24 years, but the cost of essentials has drastically increased. Please help by signing the Australian Council of Social Services petition to let our Federal politicians know it’s time to raise the rate.